Posted January 23, 2019 by Mitch Hitch & filed under City Hub, Featured City Hub. 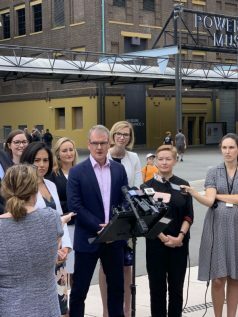 Voters will have a stark choice in the March State election after Opposition leader Michael Daley launched Labor’s cultural policy outside the Powerhouse Museum (PHM). The centrepiece of the policy is the promise to save the Powerhouse Museum and build a new $500m cultural institution in Parramatta, following proper consultation. The Riverside Theatre redevelopment at Parramatta will go ahead, and there is a $100m arts and cultural fund for Western Sydney. Drawing a line of difference with the government, Daley’s speech linked the destructive “move” of the Powerhouse with the $2.2b spendathon on stadiums. Labor’s cultural policy recognises the importance of cultural and heritage tourism to the NSW economy. Cultural and heritage visitors to NSW spent $13b in 2017, and stayed 83.8m nights, while income from sporting tourism was just $909m over 2.6m visitor nights. Still, the government’s policy is to spend up big on under-used stadiums and demolish one of Sydney’s major museums. If NSW has a tourism minister he hasn’t had any influence in Cabinet when it comes to allocating infrastructure money where it has most impact. Around $545m in Labor’s new cultural initiatives comes from not relocating the Powerhouse, demonstrating the absurd waste in the misnamed concept of “asset recycling”. The cost of “moving” the PHM is about $1.5b, partly defrayed by property development – four tower blocks at Ultimo and a 70-storey super tower at Parramatta. Much of the cost is in the wasteful demolition and building of new collection facilities and infrastructure, costs that have no cultural outcomes or impact. And far from replacing like for like, the government is planning a museum half the size of the PHM at Parramatta, with smaller and inferior collection facilities at Caste Hill. The government has criticised Labor’s announcement, forgetting their own broken promise in 2015 to create an arts and cultural precinct at Parramatta on the Old Kings School site. And why wouldn’t $500m build a world-class museum? The Sydney Modern Museum, the approved addition to the Art Gallery of NSW, is costed at $350m, and that’s supposed to be world class. Labor is doing the Parramatta museum a favour by separating it from Berejiklian’s toxic museum demolition and promising to consult widely on the form of a new Western Sydney cultural institution. That was the missing first step in the government’s scheme. Perhaps they were worried that open consultation might have risked the community saying they’d like Sydney Modern in Parramatta. All museums start with conversations and community passion, and that is what has been notably lacking in the Powerhouse to Parramatta plans. You don’t build a great museum by ministerial fiat, or as a make-work construction scheme at the behest of developers. Instead of consulting the community, the government decided Parramatta would have a museum because that was what was required to “release” the PHM’s Ultimo land for development. The Powerhouse to Parramatta scheme has never generated grass roots community passion. The local passion at Parramatta is in saving heritage places, especially the campaign to save the Fleet Street heritage precinct from the clutches of UrbanGrowth NSW. Labor has promised to preserve the precinct and support the World Heritage listing of the site. That would really get international visitors to Parramatta. Labor’s funding commitment for a new Western Sydney cultural institution, with its own board and legislation, is a vote of confidence in the nationally important stories, cultures and creativity in Western Sydney. This can never be second rate. If Labor is elected, the people of Western Sydney will have a cultural institution that gives voice to their stories, and form to their creativity. And they will decide the shape and themes of their new cultural institution, not the government and their developer proxies. That should focus the minds of voters in March.